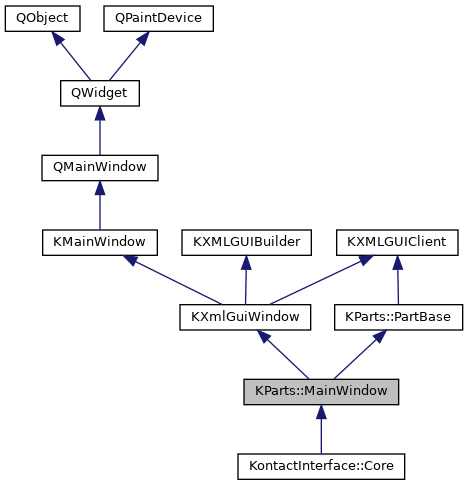 A KPart-aware main window, whose user interface is described in XML. It implements all internal interfaces in the case of a KMainWindow as host: the builder and servant interface (for menu merging). Inherit your main window from this class and make sure to call setXMLFile() and setupGUI() before you call createGUI() on the KPart. You should not pass the Default flag set to setupGUI(), since it contains the Create flag, which is not supposed to be used from this class. Definition at line 59 of file mainwindow.h. Constructor, same signature as KMainWindow. Definition at line 67 of file mainwindow.cpp. Definition at line 73 of file mainwindow.cpp. Create the GUI (by merging the host's and the active part's) You must call this in order to see any GUI being created. part The active part (set to 0L if no part). Definition at line 78 of file mainwindow.cpp. Rebuilds the GUI after KEditToolBar changed the toolbar layout. Definition at line 204 of file mainwindow.cpp. Enable or disable the automatic setting of window titles by the part's document title. By default, a part always changes the window title when the document changes. This value must be set before calling createGUI(). Definition at line 199 of file mainwindow.cpp. Definition at line 131 of file mainwindow.cpp.